Kit for 2 projects, both designed by 1894 Cottonwood House, pattern included. 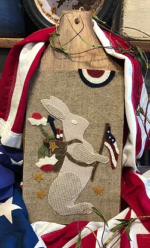 This wool applique pattern features 2 designs executed in luscious fall woolens. The kit is 100% wool with a homespun backing. The first design depicts a pantry pitcher overflowing with fall flowers and finishes a 6″ x 11″. 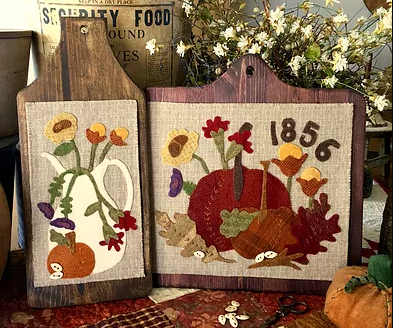 The second design is pumpkins and fall foliage with the date, 1856, marking the year the designers grandparents made their way to Salt Lake City via push carts and finishes at 11″ x 12″. 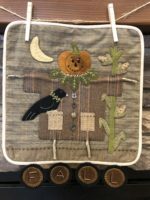 Both designs are accented by real pumpkin seed buttons, included in the kit. The projects are displayed on olde bread boards, sold separately.